The Vine COG – Page 25 – New Life. Fresh Growth. Deep Roots. Yesterday the church I’ve been Youth Pastor at for the last 11 years and Interim Pastor at the last 6 months voted on a new Pastor. I am so excited for the church and really believe that the Pastor coming in will be great. I think he is what LCOG needs right now. I’ve been here for many years and will always have a fond connection to it. I was married here, dedicated my children here, I baptized my daughter here. I will remember those moments proudly. But a new chapter is unfolding in our lives. My wife and I will be planting a new church, with a very old tradition: the Bible. We have felt the LORD leading us in this direction for the past couple years. Of course we were hesitant to step out in faith because of fear. My greatest fear was that leaving the church we have ministered at the past 11 years would hurt the Pastor. The Pastor was my dad. My wife’s greatest fear, I am sure, has been a fear that stepping out, if not in complete agreement with God’s will, would cause us harm provisionally. Sometimes God has to push us to get us to take the leap of faith he has been so gently prodding us to take. And push He has! But all things work together for the good of them that love him and are called according to his purpose (Romans 8:28). See a couple months ago my mom divorced my dad after 33 years of marriage. Dad, because of my mom’s decision, felt he had no other option but to resign the church he had Pastored for 15 years and I was given the honor and responsibility to serve as Interim Pastor. This has been the hardest six or eight months I’ve ever gone through. I never imagined my mom would divorce my dad. I never imaged I would be placed into a situation like I was faced. I never imagined I would have to explain divorce to my kids like this. But all things work for the good for those that love Jesus and are called by Him. He has a plan. I may not like what has happened, but I love Jesus and the fact that he is gonna make beauty from this mess. So we look forward to seeing where we land. This leap of faith isn’t blind, but it can be scary. I guess if it were blind it wouldn’t be as frightening because we wouldn’t see how we could crash. We know we can crash. But we also know that if we don’t jump we won’t see His purpose fulfilled. I like the quote I read today from G.K. Chesterton, he says “Courage is almost a contradiction in terms. It means a strong desire to live, taking the form of readiness to die”. I guess that’s what we feel. A readiness to die to self so that the gospel of the kingdom, the life, death and resurrection of Jesus, can be preached in power and authority by being Spirit-guided and word-centered. Making much of Jesus to the broken, lost, confused, hurt, happy, searching, hopeful, needy, black, white, brown, man, woman, rich, poor, abused, gay, straight, republican, democrat, baptist, pentecostal, unchurched, whosoever will let them come and drink freely from the water of life. The water of life makes us new as it washes over us. Because Jesus came for the whole world. Not to leave us as sinners, but so that we could experience new life. He is the vine and we are the branches. If we aren’t in Him, we aren’t alive. So we plant this new church to bring the dead to life in Jesus name. To offer fresh hope to those that have lost their way. And to make strong roots that bind us together as a community completely attached to the King. Two worship songs to remind us why we live. We live to go into the world and live out the beautiful sacrifice of Jesus. That whosoever will can be made new by the blood and resurrection of Jesus. Let’s go tell the world that it’s the blood! I’m starting a new category for posts today titled “While We Wait”. What’s the point of this newfangled category you ask? Well it’s to post books to read, videos to watch, music to listen to, sermons to hear and whatever else I decide to throw up here for you guys to check out while we wait. “Does something deep inside your heart long to break free from the status quo? Are you hungry for an authentic faith that addresses the problems of our world with tangible, even radical, solutions? God is calling you to a passionate love relationship with Himself. Because the answer to religious complacency isn’t working harder at a list of do’s and don’ts — it’s falling in love with God. And once you encounter His love, as Francis describes it, you will never be the same. You can read the first pages of the book here. I’m sure this will be a catalyst to change the way of thinking in many of you. It’s a great book. It’s a practical book. 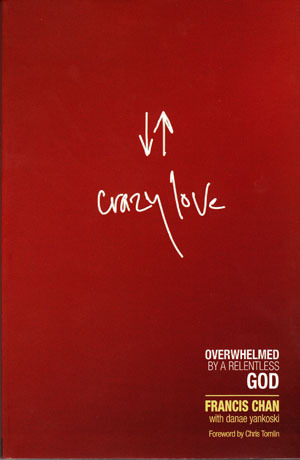 It’s a crazy love book. Check it out while we wait.